Late today we flew out over the Gulf to do some recon and give current coordinates to a boat crew headed out to collect some surface oil samples tomorrow. 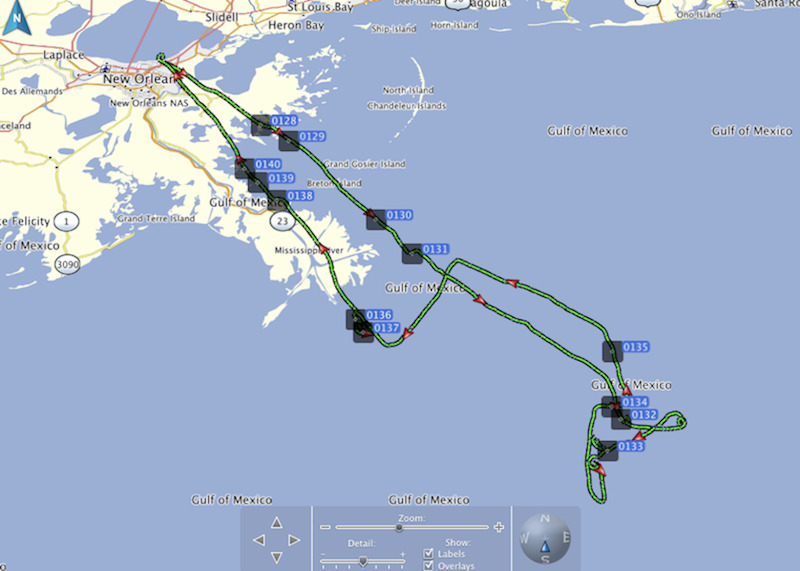 Too late to make it to the Macondo area, we focused on a site of chronic oil leakage near aTaylor Energy platform destroyed by Hurricane Ivan in 2004, about 12 miles south of the Louisiana Delta. 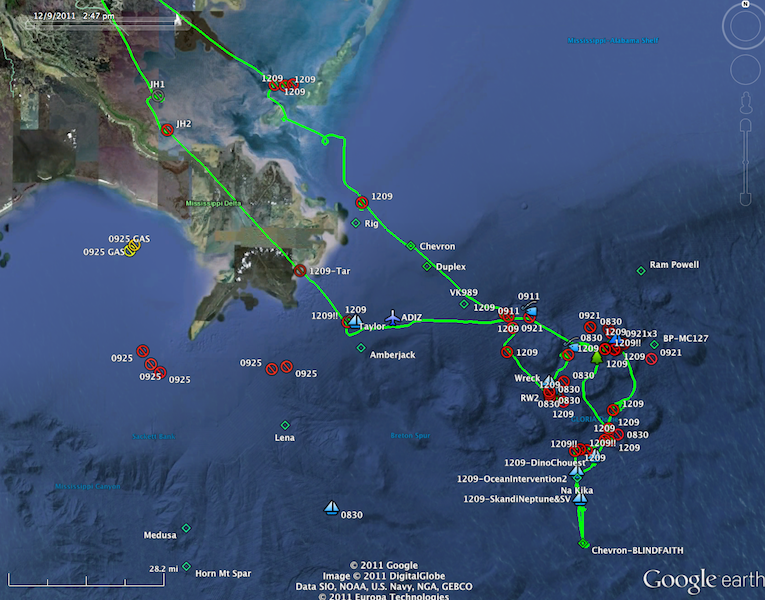 We quickly found a long line of surface oil, about 0.5-nm wide and 7 to 8 nm west-to-east. The west end is marked by a small orange float and a larger white buoy with an ominous-looking cross on top. Near the east end of the slick, where it widens some, there is a platform labeled "NKOR Energy." Enroute there and back we saw two marsh fires and some very dirty beaches, but we also enjoyed the sights of the wetlands, more white pelicans, and a memorable sunset. All of this and more is documented in our flight log provided below and in the photos and videos below. The NRC incident report we filed for the oil is also appended at the bottom of this article; the NRC incident number is #999320. And as always, you may download our entire GPS flight tracks and see our position every ten seconds along the route; see today's flight under the main menu item Flight Tracks on this site. 2011 Dec 20 - OWOC Gulf Flight - Oil and Pelicans! 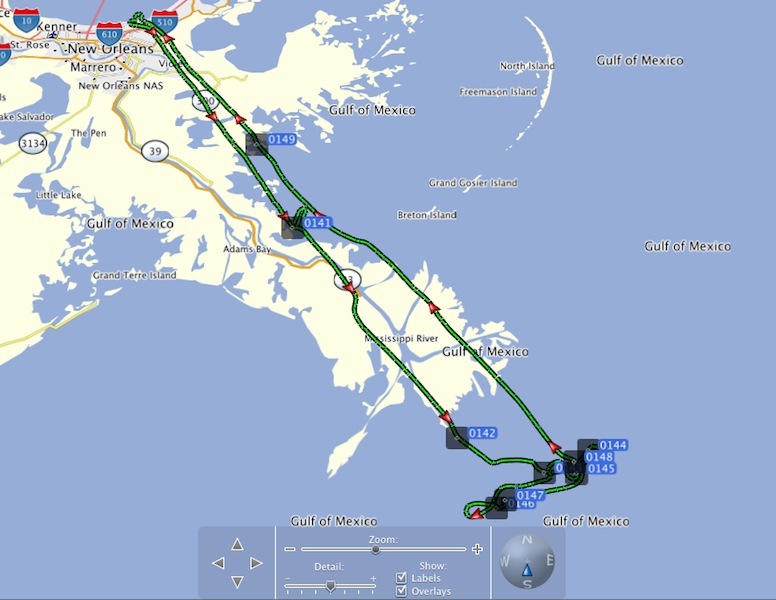 Yesterday morning, Transocean reported a 13,000-gallon (310-barrel) spill from their Deepwater Nautilus semi-submersible, which is currently drilling for Shell Oil in 7,200' of water about 26 miles southeast of the sunken Deepwater Horizon, in the Appomattox area. 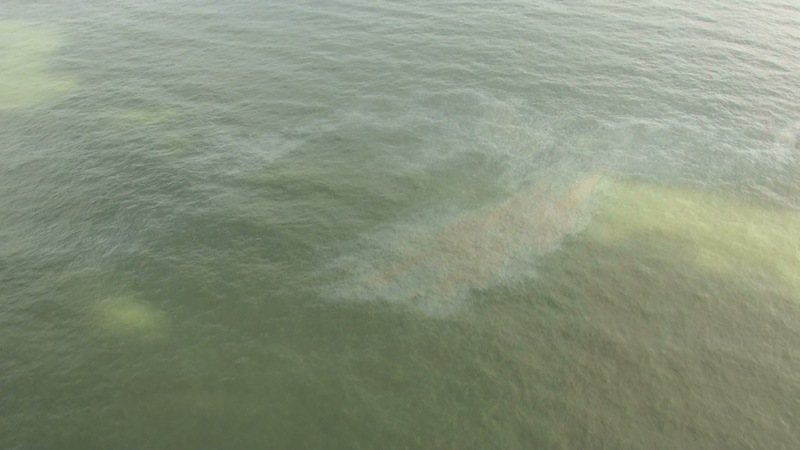 The spill was reported to be oil mixed with drilling fluid from a leak in a booster line. 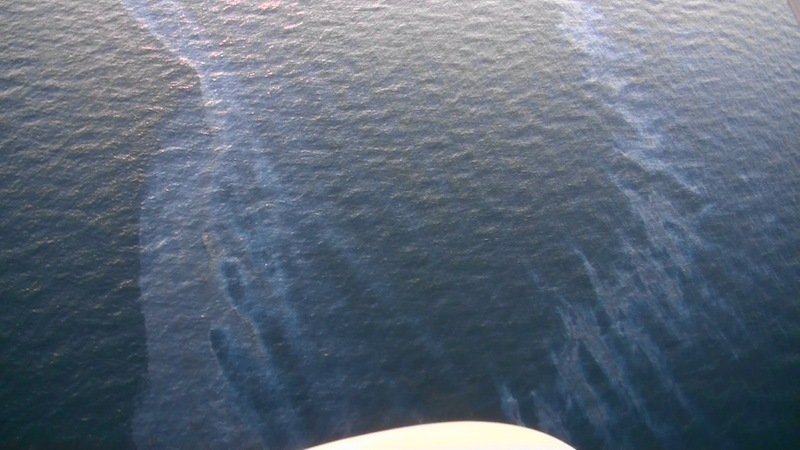 A "light surface sheen" was verified by the U.S. Coast Guard during an overflight. We arrived there a little after 11am and found two vessels: Akira Chouest and Emily Candies. The seas were too rough and visibility too poor to positively identify any surface sheen. But we can say with confidence that the many sightings of oil in the Macondo area on our last flight, December 09, and on this flight, are not associated with this drilling work. Enroute there, and on our way back from there, we found more than we expected we would see with the poor atmospheric visibility and rough seas. Yesterday and today were the first days of decent flying weather for visual surveys in ten days, but visibility was still borderline due to low clouds and mist. Seas were 4 to 6 ft too, not great for spotting oil or marine life. But in winter here in the Gulf it's futile to wait for perfect blue-sky days, so we were up and early today. 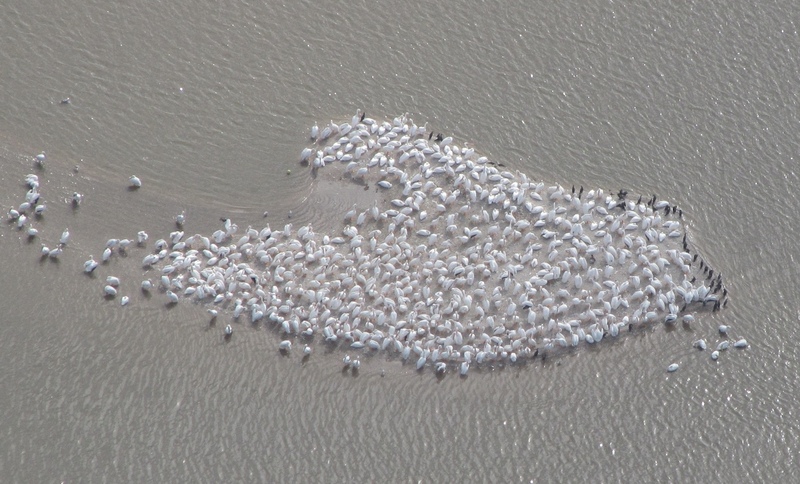 Read more: 2011 Dec 20 - OWOC Gulf Flight - Oil and Pelicans!